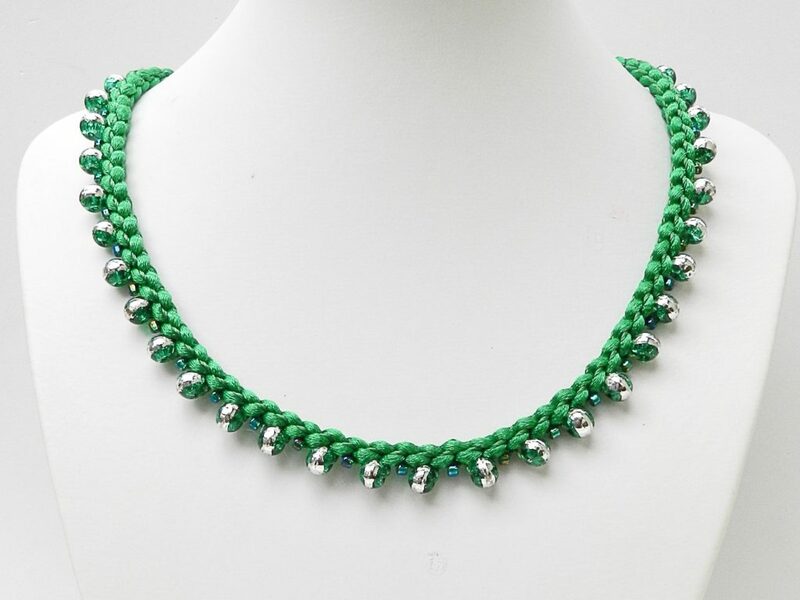 This necklace is made using 6mm round beads and size 8 seed beads. I have used glass beads with a silver foil detail, but pretty much anything can be used, such as gemstones, pearls, wooden beads etc. 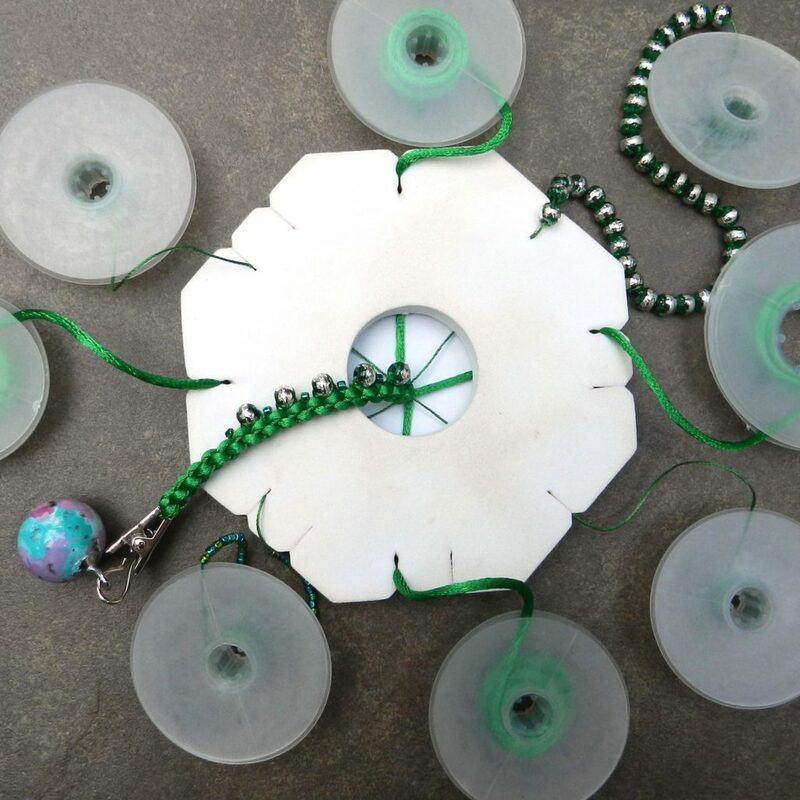 Just make sure before starting that the beading cord will fit through the holes and the edges of the hole are not sharp. The wider 2mm satin cord is recommended for this design to balance the size of the beads. However, you can try other cords and other widths. Alternative choices will affect the braid in terms of length and width and will also affect the spacing between the beads. Try braiding for a few cm to check that you like the effect. Cut the satin cord into 4 equal lengths. Cut the beading cord into 4 equal lengths. Tie them all together at one end in an overhand knot. 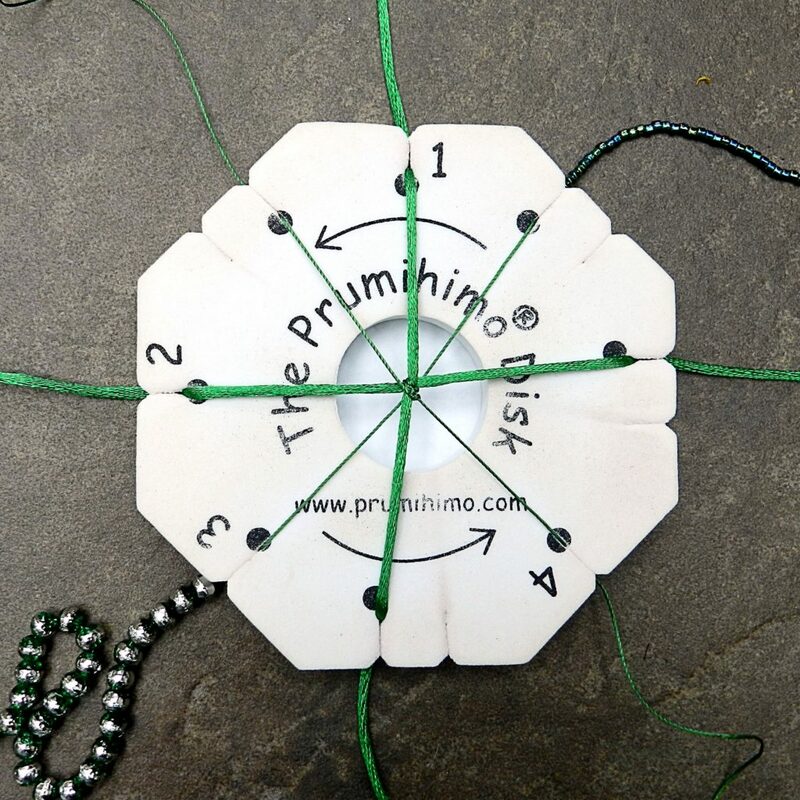 Position the cords on the disk with the satin cord in the top and bottom slots with dots at numbers 1 and 2. Put the beading cord in the top and bottom slots with dots at numbers 3 and 4. Complete the moves at number 1 and number 2. At number 3 lift the top cord, slide a seed bead down the cord, press it into the V-shape formed by the satin cords and complete the move by putting the cord in the bottom unmarked slot. Move the bottom cord up to the top slot and move the bottom cord across to the slot with a dot. Keep the bead in place with your thumb if necessary. Complete the moves at number 4 to complete the full sequence of moves. In the following sequence of moves the cords will have changed position so the 6mm beads will now be on the top cord at number 3. Complete the moves at numbers 1 and 2. At number 3 add in a seed bead from the top cord. Move the bottom cord up to the top slot, without adding a bead and move the bottom cord across. Complete the moves at number 4. Continue to braid only adding in a 6mm bead or seed bead from the top cord at number 3. The beads will all line up in an alternating pattern on one side of the braid. Braid to the required length, adding more beads if necessary. Braid for a futher 2-3cm. 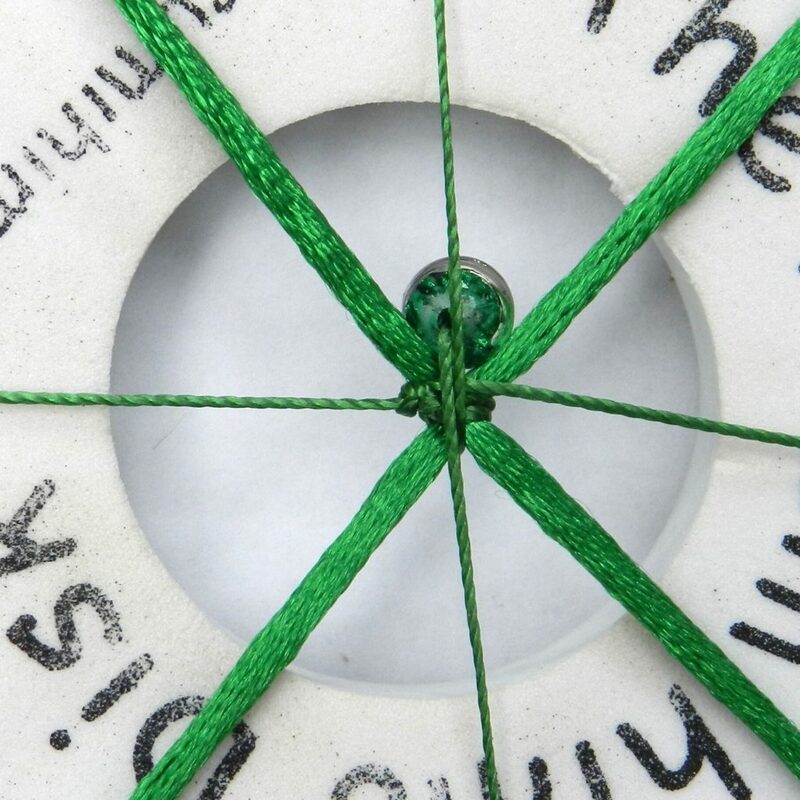 Remove the braid from the disk and tie the end in an overhand knot.